Feyenoord can expect severe sanction from UEFA after latest incidents. Feyenoord have denied claims that the inflatable banana that landed near Rona striker Gervinho was a racist gesture. UEFA are set to launch an investigation after an inflatable banana appeared to be thrown at Roma forward Gervinho in the Italian’s club’s Europea League win at Feyenood. Feyernoord’s general manager Eric Gudde said after the match that the incident was not racist but one of “pure coincidence”. “We told the UEFA delegation that this has happened for years with us,” Gudde told reporters. “I’m ruling out racism. Racism is not an issue here at all. “It was pure coincidence that the banana dropped near Gervinho. But the referee reacted very strongly on it. During half-time we explained the situation. I hope they take that into account. “I understand the irritation of fans as I, too, was surprised about some of the refereeing decisions, but it never legitimises throwing things at the linesman. Feyenoord’s coach, Fred Rutten, also denied racism was at play. 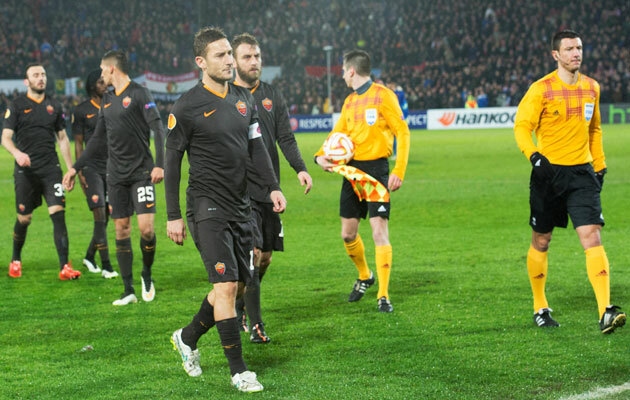 Roma won 2-1 at De Kuip to reach the last-16 of the Europa League, but both legs of the tie were overshadowed by crowd trouble. The first leg in Rome was preceded by hooliganism by hundreds of visiting fans and there were reports of disorder before Thursday’s return meeting as well, with police said to have detained 17 people. French referee Clement Turpin took the players off early in the second half after objects were thrown on to the pitch by Feyenoord supporters. The match was then suspended for around 15 minutes.